Why not enjoy the weekend with a delicious homemage breakfast? Show off your baking skills and prepare a breakfast that will have everyone feeling the love from the moment they wake up. You will be the top chef in your family and kids with a big appetite will definitely come back for seconds for this easy to make breakfast casserole originally posted on the Vive Mejor website. Preheat oven to 350°. Grease 13 x 9-inch baking dish with 1 tablespoon Country Crock® Spread; set aside. Melt remaining Spread in 12-inch nonstick skillet over medium-high heat and cook vegetables, stirring occasionally, until tender, about 8 minutes. Whisk eggs with milk in large bowl. Stir in 1 1/2 cups cheese, cooked vegetables, potatoes and bacon. Pour into prepared baking dish. Cover with aluminum foil and bake 45 minutes. Uncover, then sprinkle with remaining 1/2 cup cheese and bake 30 minutes or until eggs are thoroughly cooked. 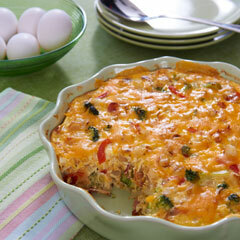 This entry was posted in For Mothers & Tias, Recipes and tagged easy recipe, Egg bake, recetas, veggies. Bookmark the permalink.